Is there a worse weather? the drizzle/chilly combination is clearly not condusive with a happy and healthy life. 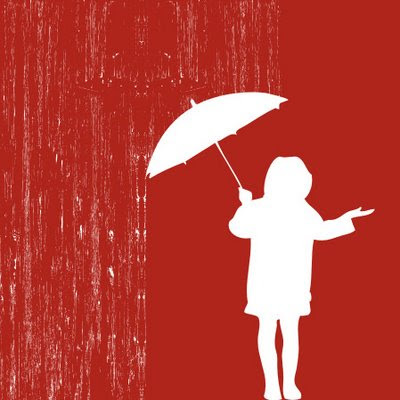 Who invented drizzle? It's the weather equivilent of the wasp. No one like it's and it serves no purpose. actually I can't think of anything that has 2 z's next to each other that I like. Grizzly bears, fizzy pop, bucks fizz (the band), ZZ Top...oh actually I like pizza, so forget that, it's just drizzle really. Apologies in advance for the generalization i'm about to make, but here goes anyway. We do events in ths shop. We love doing events in the shop. We want the shop to be buzzing with exciting stuff all the time. WELL I'M STILL WAITING FOR YOU TO ACTUALLY CALL ME BACK. I've been in touch (for example) with well over a dozen publicity people in the last month about arranging author events, and only 3 of them have actually got back to me. 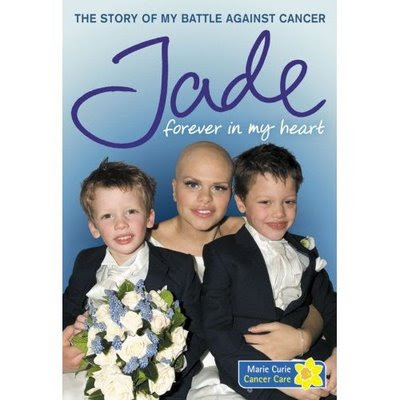 Thankyou Joe Pickering and thankyou Henry Jeffreys and thankyou Kat Jocelyn. I don't mind if you phone me back or email me to say no, or even to say you haven't heard anything yet, but you'll keep me informed. But if you say you'll call me back, PLEASE PLEASE PLEASE CALL ME BACK. as if we were able to. ps one of these books is not one we'll be keeping. I wonder if this will be as contoversial as me calling Boris Johnson a dickhead. I don't know what the point of Twitter is exactly. This doesn't mean I don't like it, but let's cut to the chase, it's a stand alone Facebook update. can you use it as a marketing tool? I guess if you have hundreds of followers you could. But this is a weird thing. If you have more followers than you are following then it would suggest you had more to offer them than they can offer you. I find this uncomfortable. 2. Join me on Twitter and I will make all your wildest dreams come true. 3. Dagenham and Redbridge will beat Brentford tonight by 3 goals to 1.
the week has been a busy one. So busy, in fact, that I haven't done a single blog. So we have some catching up to do. The first day of Film Week. As mentioned before, we were showing films all week in the shop to highlight the Wood Green International Short Film Festival. Readers of this blog voted for 2 of the films, and tonight it was Persepolis. We had all the licenses and we were borrowing the equipment from the film festival itself. At around 4pm, the screen etc arrived. It was a BIG screen. please also note the rather impressive looking sound system, and the huge speakers. We were rather surprised, but managed to set the stuff up and get it all ready by 6.30pm. I'm happy to say an eager audience showed up and I cajoled the into letting me take a quick snap. . The lady in the middle reading the programme is Hazel. She's brilliant. She does so much to help the local community, and there should be a parade for her, where she's carried aloft down the High Road followed by a dixieland jazz band. Anyway, it was a great night, and we all had fun. Tom Hodgkinson joined us for the evening to talk about the Idle Parent, to answer questions, and he also brought along his Ukulele and led us in a few songs. Tom is one of my favourite writers and also someone whose ideals I very much agree with. He's also a geniuinely nice person. This is the second time he's been to the shop, and this is the second time that I got so into the evening that I forgot to take any photos. 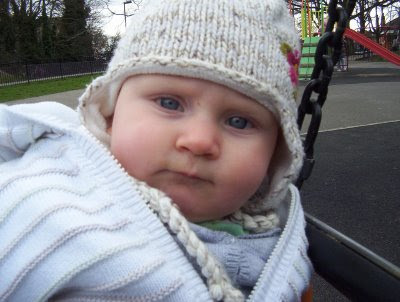 So here, instead, is a picture of Freya on a swing. . Thanks for a lovely evening Tom. Tonight was the night of The Princess Bride., and another full house. It was a bit of a scary one this, because we suddenly realised the night before that we ddin't actually have a copy of the Princess Bride to show. Thankfully we managed to dig out a copy the with a couple of hours to spare. Napoleon Dynamite was Friday's choice. Probably not a great choice for a Friday, as (and i'm generalising here), people who want to watch Napoleon Dynamite also like going out on a Friday night. Nevertheless, the hardy bunch that turned up had a thoroughly good time...I think. The week also brought 4 classes from local schools with World Book day vouchers, a bookstall at a local nursery, a rates bill for 2009 that is stinking in a most stinky way, and also a moment a Dave Gorman-like wierdness. On Saturday, I was in the shop, trying to put it back together again after a week of films, kids and mayhem. Acustomer walked through the door, who looked kind of familiar. 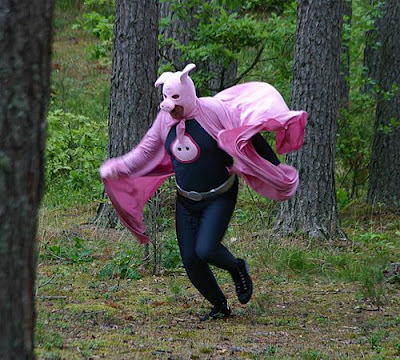 'so am I!' he replied. This lovely man to the right of me (Simon Key)is Simon Key. I'm not sure who searched who out, but we're Facebook friends through searching for people with the same name as us. I have 6 friends called Simon Key. It was a real pleasure to meet Simon, who'd travelled a long way to say hello,(and also to buy a book). 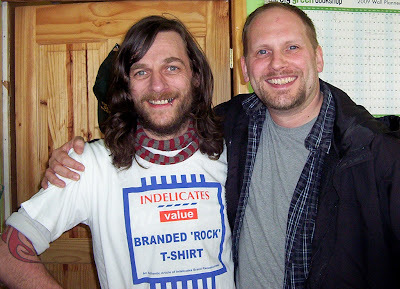 He was charming and friendly and everything you'd expect a Simon Key to be. I think i'm going to search out some more Simon Keys now and maybe next year i'll throw a big party for all of us in the shop! Today I shall be tweeting and blogging my day at work, for no other reason that I want to. 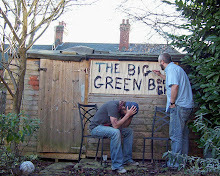 I hope it gives you an insight to the mighty world of thr Big Green Bookshop. 10.42am Breakfast consumed (3 wheet biccies and a cup of coffee) i'm putting on my shoes ready to head to the shop. No need for a coat on a day like today. 11.18am The shop's open, computer's on, ipod is on shuffle (Dexy's Midnight Runners at the momnet). Time to blow up some balloons and finish knocking up a sign for outside the shop. 11.43 Second customer in the shop. One order from the US, one out of print booksearch and one which I nweed your help on. There was a book out a few years ago in which a bloke kept a 'log' of all his visits to the toilet for a year. I can't think of the name of the book. Can you help. 11.45 Sign finished and blondie on the ipod. 11.51 First sale of the day. Tom Hodgkinson and Barack Obama. 12.15 A flurry of till activity. Moneyball by Michael Lewis and Doreen Virtue on Angles. Not I hasten to add to the same customer. 12.21 Never drink Rockstar Energy Drink and coffee at the same time. 12.42 Coffee machine on and perculating nicely. I've stuck a 'coming this week' sign on the wall of the shop, which seems to be getting very little reaction. 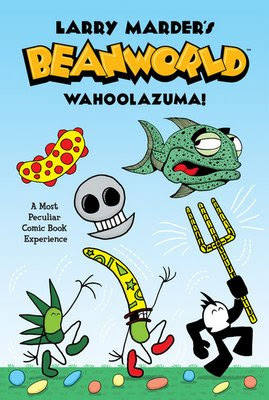 12.50 Rewritten the newsletter with the new Reading Group choices on 'POisonwood Bible' for the grown ups and The Magician's Guild for the almost grown ups. Printed out 50 copies and stuck 'em next to the door. 1.45 Finished rearranging the multicultural section, and Katie is here with Freya, reading Bathtime Peekaboo on the sofa. 2.03 A man just walked past the shop and produced two spectacular belches. 2.12 Sending out reminders of all the exciting things happening in the shop to our mailing list. 0-0 at Ashton Gate still. Let's hope City put on the style in the second half. 3.24 Gone through the Saturday and Sunday revues and have ordered a couple of things that look interesting. No more talk of football for at least an hour. 4.04 Another busy 15 minutes. Time to put some more coffee on. 4.35 Have spent a very pleasant 20 minutes in the company of Robbie, and topics touched upon included The watchmen, haruki murakami, lying convincingly, Michel Gondry, Alexander Scriabin and also stuff I knew something about. 5.15 It's all over for the day. The last books I sold were Strunk and White's Elements of Style and a Puppy board book. Time to cash up and go home. We're busy. We're always busy. But at the moment we're really busy. Here's what's happening at the moment. This week (Tuesday, Wednesday and Thursday) Tim has been taking the magnificently funny and talented kids author Guy Bass around 6 different schools. Guy's new book Dinkin Dings and the Frightening Things is a brilliant, daft and wondrous book, ideal to get kids excited about books. 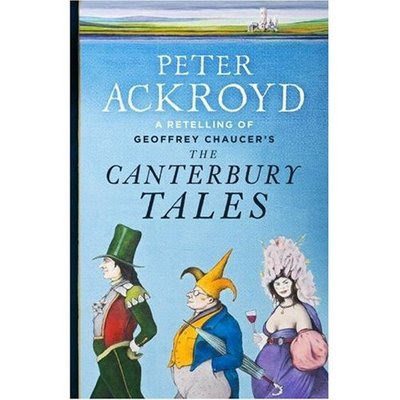 BUY IT NOW (well, buy it tomorrow from your local independent bookshop), it's only £4.99. Whilst Tim's with Guy, i've been sitting around in the shop drinking coffee and playing pacman.......no, of course I haven't. I've been organinsing the next wave of fun at the shop. Next week (Tuesday March 17th at 7.00pm) we're lucky enough to be joined by The Idler's very own Tom Hodgkinson. 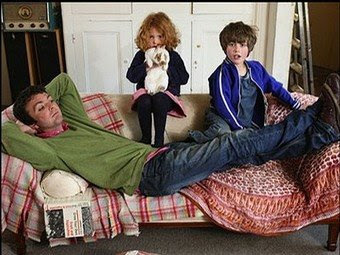 He'll be with us to talk about his new book 'The Idle Parent; why less means more when raising kids'. A wonderful antidote to those dispiriting parenting manuals, Tom is here to offer us a more...er...Idle approach. THIS IS THE ONLY FREE EVENT TOM IS DOING (if you want to pay a tenner, you're more than welcome) SO FAR. It should be a really great evening so come along, as he's also going to be bringing his ukulele with him, so we can all have a singsong as well. If you can't make it and you want a signed copy, email the shop (orders@biggreenbookshop.com), and we'll get one sorted for you. The post and packing in the UK will be just one pound!!! Bargain. 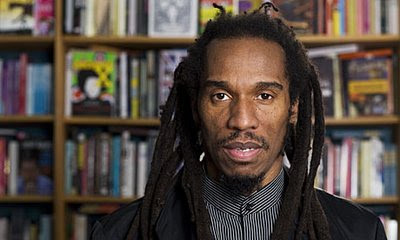 Then, on Wednesday, we'll be at a local school with Benjamin Zephaniah!! Oh, yes indeedy. He's going to be Talking Turkeys and Funky Chickens and telling us all it's a Wicked World. This should be lots and lots of fun, and once again if anyone wants a signed copy of one or 3 of his books (post and packing a quid within the UK) £4.99 each, just let us know. Also next week is when we turn the shop into a cinema in the evenings to highlight the Wood Green International Short Film Festival. all films start at 7.00pm sharp, so if you want to ensure a seat then get here early. Once again all these screenings are free (if you want to pay a tenner you're more than welcome). We have a bookstall to do next week, we'll be the bookstall at a literary festival the following week, where the main guest is Iain Banks (more to follow), we're also at White hart Lane soon with Darren Shan, and also in the next fortnight we'll be at 3 other schools with 3 different authors. This is all in March, and i haven't even started on April. .oh, and a book launch, and we're hiring the shop out for an evening. ..oh, and also we're open from 9am until 6pm Monday to Friday and 11-5 on a Sunday. ...oh, and by night Tim and I are superheroes. 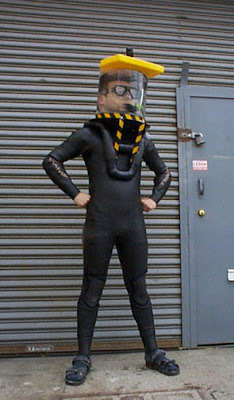 ...and I am Scuba-lad, prince of shallow water. It's a wonder we have any time left at all! We made up load of Goody Bags with a little help from some great kids' publishers. Katie and Julie made a ton of biscuits in the shape of 1s. Made a big poster for the window. We advertised in the local paper, gumtree, all the local libraries that didn't charge two quid for the privelige (even though we put up advertising for their events for free), the local nurseries, our facebook group of 596 people(Come on, let's get it to 600). We mailed out reminders to all our mailing list, although a few of these only got their emails on Friday. And there may have ben one or two posters put up around Wood Green. Katie made a marvellous cake. We re-arranged the kids section and ordered a stack load of non fiction books. We made a sign for the window that changed from 'World Book Day' (it was world book day on Thursday, and we happily accept your vouchers, and have lots of copies of the £1 books)to 'Happy Birthday'. we had some wonderful stuff like home made brownies and cupcakes (thanks Beth and Shell), as well as lots of biscuits and a bottle or two of booze given to us to enjoy the day with. We ordered extra copies of our recommended books. cleared all those little piles books that have been lying around on the shopfloor, which i'm sure every bookshop has. The Mayor Alan Dobbie and Maisy were both due to arrive at around 1.00pm, and as 12.40 arrived, there was just Tim, Katie, Freya and me in the shop, and I was a little nervous. At around 12.50 the Mayor arrived (as had Maisy and her helper), and slowly a small trickle of people started to come up the road, and into the shop. By 1.00pm the shop was jammed, and there were two long rows of pushchairs parked outside the front. 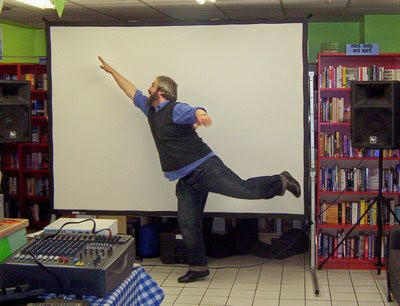 As Maisy prepared herself behind a sheet in the kid's section, Alan said some lovely things about the shop. He then gave a Mayoral decree that everything in the shop was 5% off for the rest of the day The nervous laughter was followed by us deciding to double it to 10% off. We hadn't even touched the wine. much to the delight of everyone. After two or three minutes of photo oportunities, Maisy headed outside with Claire ,her helper. As Alan suggested that now would be a good time to cut the cake, you could see the dilemma facing the children. The crowd split in two as the hungrier ones stayed inside for some yummy cake and the mouse fans followed Maisy as she headed to wards the High Road. 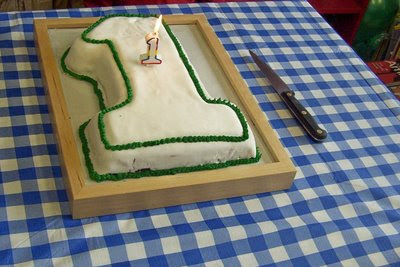 Before the cake was cut and devoured, we managed to take a picture of it. . I'm only going to mention this once more, but thanks to Katie for making it. It was brilliant. The next hour or so was a bit of a blur, as Tim and Cally (illustrator to the stars) worked tirelessly behind the counter selling books, and I cut cake and helped with pointing people in the right direction, and generally nattered with people. 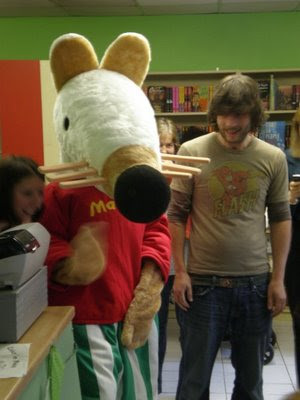 Maisy, by now had gone up the High Road and into CEX, a computer game exchange shop! to get more people up to the shop. Can I say that Maisy went above and beyond the call of duty for the shop, and so much thanks must go to Raina for making this possible. AT THIS POINT OF THE POST, CAN I ASK FOR ANYONE WHO TOOK PHOTOS DURING THE DAY TO EMAIL THEM TO US, AS IT GOT A BIT BUSY AND WE DIDN'T TAKE THAT MANY. As 2.30 approached, Alan had to head off, but not without buying a book of course. Maisy was getting a bit tired by now and came back to the shop for some cheese. There were still lots of people, although no more biscuits or cake (and a lot less books!). As our wonderful customers left and the day ended, I was left with the feeling that we are actually achieving something in Wood Green, and as long as we continue to listen to the people who come into the shop, and offer a good service and the right selection of books, and as long as we keep putting on interesting and different events in the shop, and as long as we keep on keepin on, then we might just be able to enjoy a good few more birthdays at the Big Green Bookshop. Thanks to everyone who turned up (sorry if I didn't get a chance to say hello), and all of you who've helped us through the year. 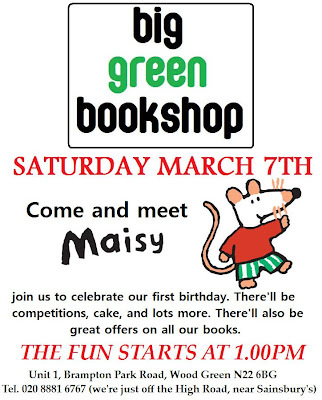 This Saturday will mark 1 year of the Big Green Bookshop. This time last year, we were putting the final touches to our wonderful wonderful shop. If you've followed our story from early on, you'll know that we had an army of volunteers who selflessly gave up their free time to help us turn an internet cafe into a bookshop in about 2 weeks. 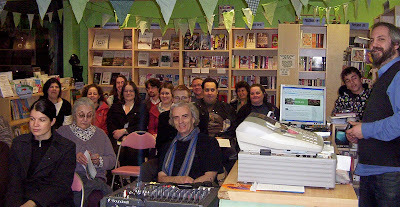 These were mainly complete strangers who'd heard tell of a couple of chancers who had ignored the various comments like 'no-one reads in Wood Green' and 'blimey, you're brave', and were intent on opening a decent independent bookshop in N22. I've tried to avoid putting youtube clips onto the blog recently, because they only serve to fill space and usually have nothing to do with what the blog's about, but this one does, so please watch it. It's a film of how we managed it. It still brings a tear to my eye, even now. So were having a party. Here's the poster. Maisy Mouse is back!!! and this time we have the Mayor Alan Dobbie to say a few words and to cut the cake, which Katie is preparing as I type. 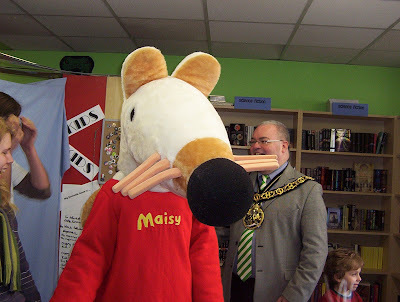 You will never see the Mayor and Maisy Mouse in the same room at the same time, but don't let's start any rumours now. Discounts on ALL our books!!! All this starts at 1.00pm, with Alan and Maisy, and it would be great if you could come along and say hello. If you haven't had a chance to visit us yet, maybe this is a good opportunity to see how we're getting on.